Read most common questions about Leticia AntiAge pillow. Leticia AntiAge Pillow helps you maintain your youthful appearance. 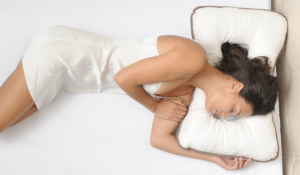 The unique shape of the pillow with the whole in the middle provides optimal support for support cervical vertebrae and at the same time prevents sleeping facial wrinkles. What is Leticia AntiAge pillow made of? AntiAge pillow is ergonomic, orthopedic and anti-allergic pillow. It is made of special mix of siliconized polyester beads, LetiPur memory foam flakes with bio soybeans and high-elasticity LetiCell foam flakes with bio soybeans. The cover of the pillow is made of high-quality cotton satin. What is the difference between classic and Leticia AntiAge pillow? 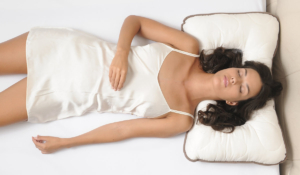 While sleeping on classic pillow you feel the pressure on our face, neck and spine. Repeating and long-lasting pressure on softer facial parts causes formation of wrinkles. Leticia AntiAge pillow eases those pressures due to its unique design. What are expected results of using Leti-cia AntiAge pillow? Sleeping on Leticia AntiAge pillow eases formation of sleeping and aging wrinkles that are caused by pressing your face against the pillow all night. Those wrin-kles emerge around eyes (so called laughing wrinkles) and in the area be-tween nose and mouth. Leticia AntiAge pillow is not comfortable. How should I adapt it to my body? Leticia AntiAge pillow is extremely adaptable. You can easily find a position that is most comfortable for you. If you are not comfortable try setting the width of the pillow again, so it fits your face correctly. Try also which side of the pillow is more suitable for you. If you are bigger you will probably be more comfortable sleeping on wider and higher support side. If you are smaller you will be more comfortable on narrower and lower support side of Leticia AntiAge pillow. Leticia AntiAge pillow will gradually become softer. This in normal and doesn’t affect quality of your sleep. With soft hand pressing of the filling you adapt firmness of particular part of the pillow. Is Leticia AntiAge pillow suitable for all types of skin? Leticia AntiAge pillow is made of high-quality skin friendly materials and can be used regardless on your skin type. I know cheaper beauty pillows. Why should I purchase Leticia AntiAge pillow? Leticia AntiAge pillow was designed by collaboration of a large group of scientists from different fields to make a quality product. Its life span is much longer due to the use of high quality and health-friendly materials. Purchase decision will result on your well-being and pillow’s long lasting. Where can I buy Leticia AntiAge pillow? You can buy Leticia AntiAge pillow in this web page’s store. Why choose Leticia AntiAge pillow? Leticia AntiAge pillow helps you maintain your youthful looks. Its unique patented form with an opening in the middle ensures optimal support for neck vertebrae and prevents sleeping wrinkles on face. Leticia AntiAge pillow has a simple string-system to adapt the shape of the pillow to your face, body constitution and sleeping position. What kind of cover should I use? You can use any ordinary pillowcase. The most suitable size is 60×80 cm. which is also one of the most com-mon pillowcase sizes in bedding. You have to make sure the pillowcase is not too small, since that would decrease main advantage Leticia AntiAge pillow has to offer – patented opening in the middle. You rather use pillowcase that is too big than too small. What is the right use of Leticia AntiAge Pillow? The design of the Leticia AntiAge pillow allows perfect adap­tation of the pillow to your body type and sleeping position. Your comfort should, however, be your first priority. Maybe you’ll have to adapt size of the opening in the middle, to optimally adjust your face features. Do that with the string in the middle of the pillow. Tying is short will cause opening in the middle to reduce. Tying it loose will extend it. Put on any pillowcase that fits the pillow and enjoy a good night’s sleep. What about my sleeping position. Is Leticia AntiAge pillow suitable for all? Leticia AntiAge pillow is suitable for any sleeping position. How long does the body need to adapt to a new Leticia AntiAge pillow? Your body will need a few days of adjustment after changing your old pillow with Leticia AntiAge. Use it regularly to allow your body to adapt to the change. Does Leticia AntiAge pillow have any side effects? Leticia AntiAge pillow has no side effects. At what age is recommended to start using Leticia AntiAge pillow? It’s never too early for prevention. You can start using Leticia AntiAge pillow at any age or when you start to worry about facial wrinkles. Also, pillow is low and fits perfectly to sleepers who prefer lower pillows. I don’t have facial wrinkles. Should I even start using Leticia AntiAge pillow? If you don’t have facial wrinkles yet, you can start using Leticia AntiAge pillow as a prevention. The sooner you prepare for older years, more results will be seen. There are no visible changes on my face, even after couple of months. Does Leticia AntiAge pillow work on me? The reason for no visible changes may be the irregular use of Leticia AntiAge pillow. When you lay, your face must be in the middle opening of the pillow. This way your face wont press on the pillow during sleep. The other reason might be your DNA. Despite the use of Leticia AntiAge pillow you will not feel or notice the changes on your face. Everyone is unique and this is the reason why Letica AntiAge pillow might not work the same with everyone. You must know that generally pillow Leticia AntiAge prevents forming new compression wrinkles and doesn’t remove the ones that are already there. Leticia AntiAge pillow needs no cleaning and is easy to maintain. Due to the use of additional pillowcase you only need to regularly wash pillowcase and not the pillow itself. If needed, you can wash it by hand. Squeeze it gently and make sure that you undue the string in the middle first. Use liquid washing machine detergent. It can take several days for Leticia AntiAge pillow to get perfectly dry. Dry it horizontally and do not expose it to direct sunlight. Leticia AntiAge pillow is too low for me. What can I do? Leticia AntiAge pillow belongs in the group of lower pillows. If it’s too low for you, simply add another classic pillow underneath it, to achieve desired height, whilst keeping all anti-aging features of the original anti-aging pillow. Works perfectly! How does Leticia AntiAge pillow work? While sleeping on the side or on the stomach your face presses onto the pillow. A repeated and prolonged pressure on the soft parts of the face causes wrinkles, making you look older. The Leticia AntiAge pillow releases the pressure from the sensitive facial parts which will make your skin look smoother, firmer and more youthful. Does Leticia AntiAge pillow really prevents facial wrinkles? The mechanism of favorable impact of the pillow on facial wrinkles has been explained in a scientific study published in the Journal of Cosmetic and Laser Therapy, 2012; 14: 133-138. Leticia AntiAge pillow does not treat existing wrinkles. Right use helps to prevent the development of new sleep induced wrinkles on your face. Physical aging of the body is normal and can’t be stopped with Leticia AntiAge pillow.